In the era of social media and review sites, businesses must be wide-awake and well versed with new media. Gone are the days when disputes and bad customer service were negotiated face-to-face or over a phone call.Today, every damn thing is brought online and discussed publicly. In some cases, social media has been used for threatening big brands while in others it has empowered customers with a voice to express their opinion.. If not taken seriously, it can prove lethal for your brand. 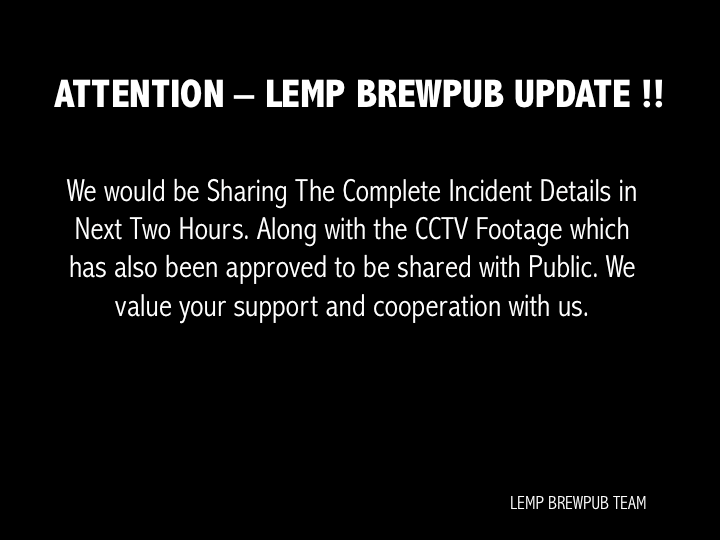 We all have witnessed how Lemp Brew Pub issue has been going viral for all the wrong reasons. A devastating review against Lemp’s bad customer service was published in the form of a very detailed blog post. In no time, it got picked and the news spread like a wild fire, turning the pub’s reputation into ashes. To make it worse, the incident got covered in the mainstream media as well. Surprisingly, the review blog has been mysteriously deleted but you can read the whole post here. Was the blogger intimidated by some force to delete the post? The blog mentions that the youngsters tried to show Zomato’s screenshot to the police but the police could not understand what Zomato is. Pity that out police force in not updated about the digital world at all. Although Lemp did not react to it immediately, it did try escaping the situation by changing the name of its Facebook Profile to Purple Bar Gurgaon. I am sure they would have tried to change the name of their Facebook page as well, but you can only change the name of a Page if it has fewer than 200 likes. If they are saying they are not wrong, why did they even try to misguide people by changing their name? Online crisis compel you to react urgently but I would not blame the Social Media team of the pub here. One cannot make any public statements if the matter is under investigation. Considering the fact that police was inspecting the case, did they have an option? They were legally bound. And this is why we repeatedly recommend you to have a Social Media Crisis policy in place. When a crisis strikes, you have no time for planning and prevention. It was evident that without being prepared with an online crisis management plan and proper training, Lemp was left vulnerable, leaving its reputation to suffer damage. Or for that matter mishandling it. On Friday, Lemp declared on their Facebook page that their servers were hacked and someone has been using their email address and posting inadmissible comments across the digital platform. How convenient to say that! We reached out to Lemp’s PR team and we were told that an agency named Webinitiate is handling their Social Media. We also figured out that neither their General Manager, Deepak nor their owner, Shashank is active on social media. An agency named Team Orange handles their PR. Lemp is trying its best to repair its tarnished image by inviting press for a Hawaiian Brunch. However, I feel the damage done is irreversible now. The press note that they sent out looks a little amateurish. Instead, it makes more accusations. It is very unfortunate that through irresponsible use of social media an attempt to tarnish our reputation which we have built steadfastly has been made. Lemp believes that there has been a planned, deliberate attempt by some tech savvy people to tarnish their brand’s image. I am of the opinion that any business which thinks it can control the fans or social media is wrong! Social Media cannot be controlled! We were suggested by competent authorities not to give in to the urge of responding to all the hate messages on social media and the ensuing abusive calls that we are still flooded with. How can you conveniently believe that it would be wiser not to respond, to negative feedback on social media? 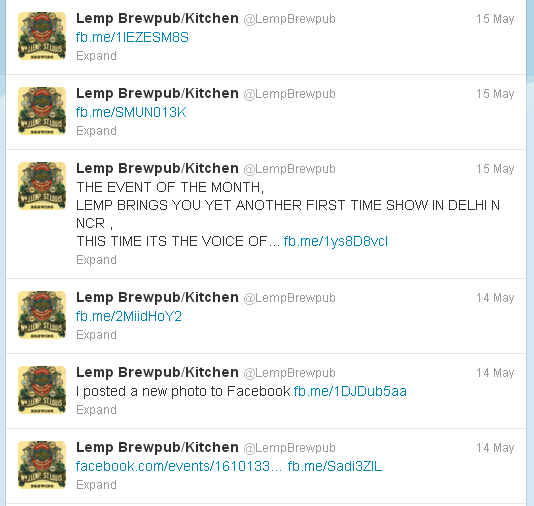 Those who are a little aware about the social media and the way it works would agree that it cannot be the handiwork of a few to malign Lemp Brewpub & Kitchen alone. The timelines and snapshots of the social media platforms wherein the hate wave was initiated against us is a proof enough. Our digital and social media agency has assessed and analyzed the same. Hundreds of LIKES and posts within a second of posting the content has to be the handiwork of a full-fledged digital and social media agency hired solely with a particular motive. Lemp claims that there were hundreds of likes and comments on the blog, the minute it was published. People were ready to pounce on it. They conceive it to be planned. On the other hand, I believe, social media is viral by nature. Maybe people were so outraged that the issue was picked up and it went viral. There maybe a possibility that the one who blogged about it could be an influencer and many people read about it instantly. Alternatively, maybe an influencer could have retweeted/shared the blog. You cannot counterclaim that it was planned and motivated. To say that people came to their place, had food, acted like troubled customers and went online to write about it and make a scene, because of some personal vengeance? Let me think who would do such a thing? Some people stood by Lemp even after the embarrassing event. Yet I am very skeptical about them. 1. 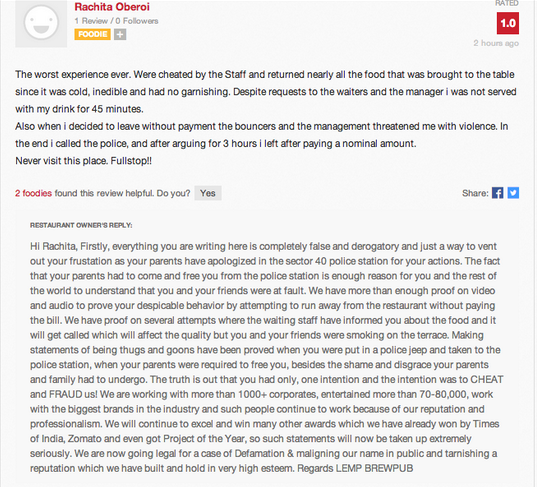 Shruti Sharma, supposedly a loyal customer of Lemp came back with a response on Zomato. Shruti has written only 4 reviews, out of which 3 of these are for Lemp and 1 is against a competing pub in Gurgaon.. Already there must have been a lot of social marketing companies that would have been paid for this negative publicity of the pub by the rival companies due to its rapid booming reputation, please don’t post and share just because you heard it somewhere and want to join in with this so called social cause when you aren’t even aware of those incidents. What you people did only helped those internet marketing companies, and the sad part my friends, you worked for them for free! The person, who is talking about social media, does not seem to be active on twitter. 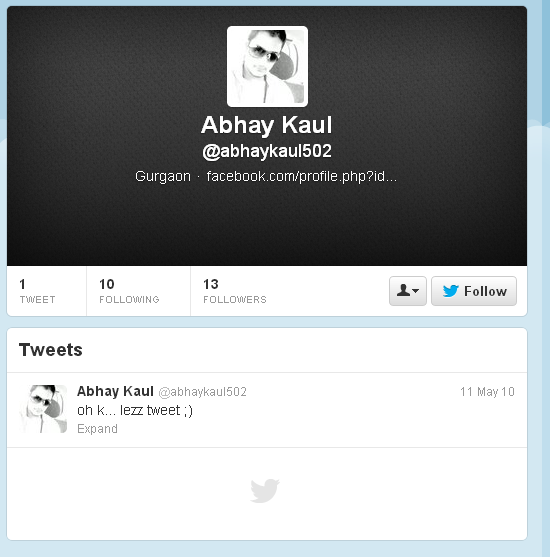 He has tweeted only once. His blog archive shows only one blog, the one that is in favor of Lemp. 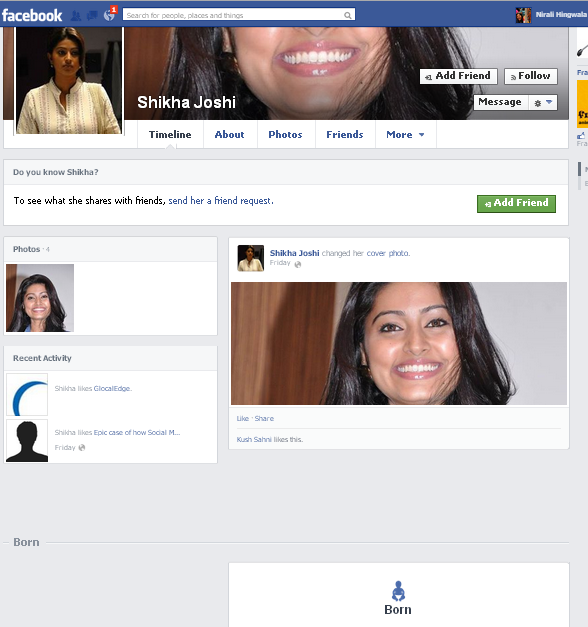 Shiksha Joshi – This profile seems to be fake. It was created on 13th June, Friday. In fact, even Lemp is not active on Social Media. Guess they realized how helpful or dangerous social media can be only after this incident. There was only cross posting on their twitter profile. This is the reason why I do not believe Lemp when they say it was all planned. Maybe they don’t understand the platform so well in the first place. This is not how the hospitality industry behaves. They need to maintain a certain grace in the tone. If an unhappy customer threatens to post something negative about your brand online, you get an opportunity to respond and do your best to correct their distasteful experience. A bad experience can be turned into a loyal customer. You need to figure out what is wrong about your brand, where did you go wrong. You need to be prepared beforehand. The way Lemp responded was disgraceful! Never, I repeat, NEVER respond to a customer in such a tone. Especially online. Notably, Lemp’s PR team narrated that they got many abusive calls after the incident. Initially, it was Zomato’s number on the listing. Soon after the episode, Zomato changed the number on the listing to that of Lemp and all the calls went directly to Lemp. Lemp was very disappointed with its advertising partner on whom they invested money. On the other hand, Zomato was fleet-footed in responding with a blog post. Deepinder Goyal affirmed that Zomato would be neutral and they think that delisting Lemp would be the stupidest thing to do. They want their users to see the ratings/reviews and decide whether to visit that place. Lemp thinks Zomato washed its hands off without not realising that review sites are supposed to be neutral. They then started threatening that they are the social media gurus and that Lemp will have to pay for this mistake heavily. Now this raises some questions in my mind – Who were these people? Do they belong to the Social Media industry? Has threatening big brands and blackmailing them on Social Media become prevalent in our country? I have no idea who was right or wrong. But this is a serious matter that most of the brands have been facing. As Karthik noted in his blog, Lemp Brew Pub’s average rating before the whole episode was 3.10 on Zomato. Out of these 382 reviews, there were 31 5-star reviews, 27 4-star reviews and 38 1-star reviews. After all the hullabaloo on Social Media, Zomato had 900+ reviews for Lemp with almost all of them severely negative. I feel most of these people might not have even visited the place, while others merely had the link to the blog post. While Lemp is limping back to normalcy, we were told that the Cyber Cell is investigating this incident. They will have to take some serious steps to repair their reputation. I am sure a person will think 100 times before visiting the place. I have many unanswered questions in my mind about the whole episode and I am sure even you would be curious. Which is why Social Samosa reached out to their team. 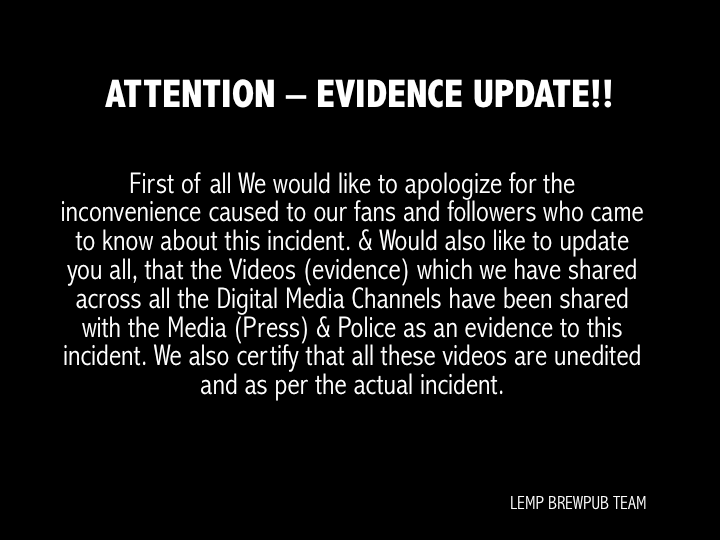 We will have Lemp’s team in a live Google Hangout chat where you can ask them questions regarding their approach towards the incident and the resulting negative buzz on social media. The ‘Twangout’ is on this coming Tuesday, June 18, between 12PM – 1PM. 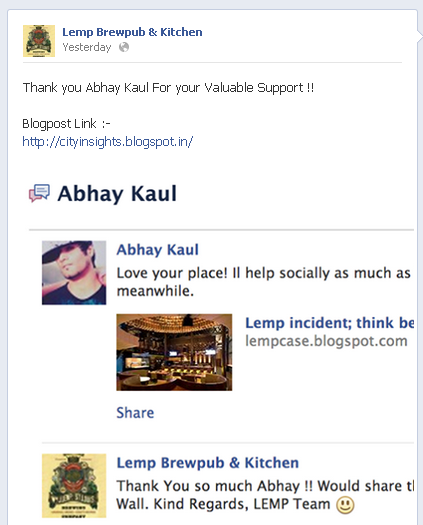 The respondent shall be Akshay Lutharia, Owner, Lemp, BrewPub & Kitchen. So ask away all your questions!